Almost every nation in the world uses masks for some cultural purpose. Masks may form an integral and central part of a society’s culture, or they may be merely peripheral to it, but few have no masks at all. Because cultures vary in their belief systems, some masks are highly realistic and others are abstract. The degree of abstraction frequently has nothing to do with the mask maker’s skill and everything to do with cultural conceptions of what is represented by the mask. The being represented may be an actual animal or type of person (or even a famous individual). It may be a mythical beast, a spirit, or a god. It may even be an abstract concept. The uses to which masks are put in a culture are as varied as the depictions they represent, but there are definite patterns to each. Masks may be used for purposes as culturally important as social bonding through traditional rituals, or the invocation of supernatural powers, or they may merely facilitate entertainment. What they have in common is that they transform the wearer, presenting a new face to the outside world. 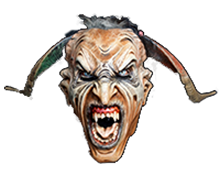 This second face overlaying the first may change more than the appearance of the mask wearer; it may change his or her psychological outlook. Empirical studies in the United States show that a person wearing a mask is more likely to violate laws, moral codes, and customs of politeness. In many cultures, especially in Africa, Europe and Latin America during Carnival, and the South Pacific Islands, the mask clearly serves this function, allowing the wearer to commit antisocial acts under the guise of a spirit that would be punishable if performed by an unmasked person. Still other masks are used to bond the community together by channeling ancestor spirits, teaching community values, or enforcing cultural norms by making the wearer an anonymous agent of social justice. In still other cases, the mask plays a priestly function, elevating the wearer into a society’s agent for communing with higher powers. The masks displayed in this museum are all used for cultural expression. They may be for anything from sacred rituals to pure entertainment, but each mask embodies its maker’s beliefs about a culturally significant organism, whether real or mythological, that the mask represents. In other words, almost all masks in the museum’s collection represent “archetypes,” an idealized pattern typical in the culture it is used. At the same time, the individual perspective of the mask’s creator usually finds some outlet in the particularities of the mask. In many cases, a mask creator’s style is so unique that, although the cultural type of the mask is immediately recognizable, the individual who created it can be identified merely by glancing at the mask. Consequently, the subject matter of the museum straddles the line between folk art and anthropology. (Masks purely for decorative or practical purposes, such as the protective masks a welder or hockey goalie uses, are not represented here. Nor are masks solely to adorn corpses or for display in buildings.) Many masks on display are old and culturally used, while others were acquired from the makers new. In every case, they represent important cultural archetypes for the society in which they originated. Second Face is the only fully online ethnographic mask museum of worldwide scope. It is a federal nonprofit corporation under Section 501(c)(3) of the Internal Revenue Code, organized under the laws of Arizona. We are free to the public and fund ourselves entirely through your donations and sales at the museum shop. Unless otherwise noted, all photographs on this website that are not in the public domain are subject to copyright © by Aaron Fellmeth, 2017, all rights reserved. We hope you enjoy the museum.